In April 1754, on his way to establish a post at the Forks of the Ohio (the current site of Pittsburgh), Washington learned that the French had already erected a fort there. Warned that the French were advancing, he quickly threw up fortifications at Great Meadows, PA, aptly naming the entrenchment Fort Necessity, and marched to intercept advancing French troops. In the resulting skirmish the French commander was killed and most of his men were captured. 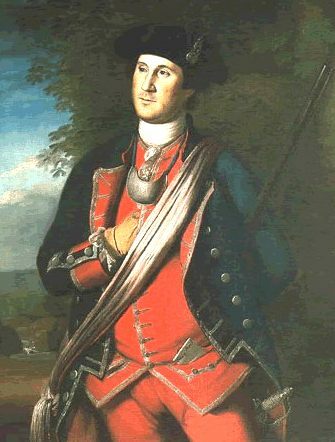 Washington pulled his small force back into Fort Necessity where he was overwhelmed (July 3) by the French in an all-day battle fought in a drenching rain. Surrounded by enemy troops, with his food supply almost exhausted and his dampened ammunition useless, Washington capitulated. Under the terms of the surrender signed that day, he was permitted to march his troops back to Williamsburg. Discouraged by his defeat and angered by discrimination between British and colonial officers in rank and pay, he resigned his commission near the end of 1754. However the next year he volunteered, joining British general Edward Braddock's expedition against the French. When Braddock was ambushed by the French and their Indian allies on the Monongahela River, Washington, although seriously ill, rallied the Virginia troops. Washington's own military reputation was enhanced, and in 1755, at the age of 23, he was promoted to Colonel and appointed commander in chief of the Virginia militia, with responsibility for defending the frontier. Washington visited the area we now call Henry County in 1756. At that time the area was part of Halifax County and Washington came to inspect the 3 forts built along the western frontier. The forts were built by by Capt. Nathaniel Terry who held a commission dated 13 Aug. 1755 in Lunenburg County. According to George Washington, Terry himself was in command of the fort on Blackwater River; a Captain Galloway commanded Fort Trial on Smith River; and Captain Samuel Harris held the most southern in the chain of forts located on Mayo River. Washington left Winchester on 9/29/1756 and returned on10/22/1756, visiting Ft. Mayo on October 19th. At the time of his visit he was only 24 years old. In writings to then Governor Dinwiddie, he described Fort Trial as being in an out of the way place. He also described the militia as being lazy and incompetent and unwilling to protect people living along the frontier. Source: The Papers of George Washington, Diaries, ed. Donald Jackson, et al, Charlottesville: University of Virginia Press, 1976-1979.